This article is about the computational prediction of nucleic acid structure. For experimental methods, see Nucleic acid structure determination. Nucleic acid structure prediction is a computational method to determine secondary and tertiary nucleic acid structure from its sequence. Secondary structure can be predicted from one or several nucleic acid sequences. Tertiary structure can be predicted from the sequence, or by comparative modeling (when the structure of a homologous sequence is known). The problem of predicting nucleic acid secondary structure is dependent mainly on base pairing and base stacking interactions; many molecules have several possible three-dimensional structures, so predicting these structures remains out of reach unless obvious sequence and functional similarity to a known class of nucleic acid molecules, such as transfer RNA (tRNA) or microRNA (miRNA), is observed. Many secondary structure prediction methods rely on variations of dynamic programming and therefore are unable to efficiently identify pseudoknots. While the methods are similar, there are slight differences in the approaches to RNA and DNA structure prediction. In vivo, DNA structures are more likely to be duplexes with full complementarity between two strands, while RNA structures are more likely to fold into complex secondary and tertiary structures such as in the ribosome, spliceosome, or transfer RNA. This is partly because the extra oxygen in RNA increases the propensity for hydrogen bonding in the nucleic acid backbone. The energy parameters are also different for the two nucleic acids. The structure prediction methods can follow a completely theoretical approach, or a hybrid one incorporating experimental data. A common problem for researchers working with RNA is to determine the three-dimensional structure of the molecule given only a nucleic acid sequence. However, in the case of RNA much of the final structure is determined by the secondary structure or intra-molecular base pairing interactions of the molecule. This is shown by the high conservation of base pairings across diverse species. Secondary structure of small RNA molecules is largely determined by strong, local interactions such as hydrogen bonds and base stacking. Summing the free energy for such interactions should provide an approximation for the stability of a given structure. To predict the folding free energy of a given secondary structure, an empirical nearest-neighbor model is used. In the nearest neighbor model the free energy change for each motif depends on the sequence of the motif and of its closest base-pairs. The model and parameters of minimal energy for Watson–Crick pairs, GU pairs and loop regions were derived from empirical calorimetric experiments, the most up-to-date parameters were published in 2004, although most software packages use the prior set assembled in 1999. The simplest way to find the lowest free energy structure would be to generate all possible structures and calculate the free energy for it, but the number of possible structures for a sequence increases exponentially with the length of RNA: number of secondary structures = (1,8)N, N- number of nucleotides. For longer molecules, the number of possible secondary structures is huge: a sequence of 100 nucleotides has more than 1025 possible secondary structures. The first and the most popular method for finding the most stable structure is a dynamic programming algorithm. One of the first attempts to predict RNA secondary structure was made by Ruth Nussinov and co-workers who used the dynamic programming method for maximizing the number of base-pairs. However, there are several issues with this approach: most importantly, the solution is not unique. Nussinov et al. published an adaptation of their approach using a simple nearest-neighbour energy model in 1980. In 1981, Michael Zuker and Patrick Stiegler proposed using a slightly refined dynamic programming approach to modelling nearest neighbor energy interactions that directly incorporates stacking into the prediction. Dynamic programming algorithms provide a means to implicitly check all variants of possible RNA secondary structures without explicitly generating the structures. First, the lowest conformational free energy is determined for each possible sequence fragment starting with the shortest fragments and then for longer fragments. For longer fragments, recursion on the optimal free energy changes determined for shorter sequences speeds the determination of the lowest folding free energy. Once the lowest free energy of the complete sequence is calculated, the exact structure of RNA molecule is determined. Dynamic programming algorithms are commonly used to detect base pairing patterns that are "well-nested", that is, form hydrogen bonds only to bases that do not overlap one another in sequence position. Secondary structures that fall into this category include double helices, stem-loops, and variants of the "cloverleaf" pattern found in transfer RNA molecules. These methods rely on pre-calculated parameters which estimate the free energy associated with certain types of base-pairing interactions, including Watson-Crick and Hoogsteen base pairs. Depending on the complexity of the method, single base pairs may be considered, and short two- or three-base segments, to incorporate the effects of base stacking. This method cannot identify pseudoknots, which are not well nested, without substantial algorithmic modifications that are computationally very costly. Not all known RNA folds in such a way as to conform with the thermodynamic minimum. For this reason, the ability to predict structures which have similar low free energy can provide significant information. Such structures are termed suboptimal structures. MFOLD is one program that generates suboptimal structures. One of the issues when predicting RNA secondary structure is that the standard free energy minimization and statistical sampling methods can not find pseudoknots. The major problem is that the usual dynamic programing algorithms, when predicting secondary structure, consider only the interactions between the closest nucleotides, while pseudoknotted structures are formed due to interactions between distant nucleotides. Rivas and Eddy published a dynamic programming algorithm for predicting pseudoknots. However, this dynamic programming algorithm is very slow. The standard dynamic programming algorithm for free energy minimization scales O(N3) in time (N is the number of nucleotides in the sequence), while the Rivas and Eddy algorithm scales O(N6) in time. This has prompted several researchers to implement versions of the algorithm that restrict classes of pseudoknots, resulting in performance gains. For example, pknotsRG tool includes only the class of simple recursive pseudoknots and scales O(N4) in time. Another approach for RNA secondary structure determination is to sample structures from the Boltzmann ensemble, as exemplified by the program SFOLD. The program generates a statistical sample of all possible RNA secondary structures. The algorithm samples secondary structures according to the Boltzmann distribution. The sampling method offers an appealing solution to the problem of uncertainties in folding. 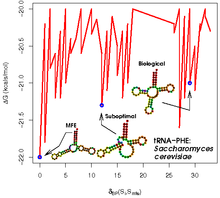 S. cerevisiae tRNA-PHE structure space: the energies and structures were calculated using RNAsubopt and the structure distances computed using RNAdistance. A practical heuristic approach is to use multiple sequence alignment tools to produce an alignment of several RNA sequences, to find consensus sequence and then fold it. The quality of the alignment determines the accuracy of the consensus structure model. Consensus sequences are folded using various approaches similarly as in individual structure prediction problem. The thermodynamic folding approach is exemplified by RNAalifold program. The different approaches are exemplified by Pfold and ILM programs. Pfold program implements a SCFGs. ILM (iterated loop matching) unlike the other algorithms for folding of alignments, can return pseudoknoted structures. It uses combination of thermodynamics and mutual information content scores. Evolution frequently preserves functional RNA structure better than RNA sequence. Hence, a common biological problem is to infer a common structure for two or more highly diverged but homologous RNA sequences. In practice, sequence alignments become unsuitable and do not help to improve the accuracy of structure prediction, when sequence similarity of two sequences is less than 50%. Structure-based alignment programs improves the performance of these alignments and most of them are variants of the Sankoff algorithm. Basically, Sankoff algorithm is a merger of sequence alignment and Nussinov  (maximal-pairing) folding dynamic programming method. Sankoff algorithm itself is a theoretical exercise because it requires extreme computational resources (O(n3m) in time, and O(n2m) in space, where n is the sequence length and m is the number of sequences). Some notable attempts at implementing restricted versions of Sankoff's algorithm are Foldalign, Dynalign, PMmulti/PMcomp, Stemloc, and Murlet. In these implementations the maximal length of alignment or variants of possible consensus structures are restricted. For example, Foldalign focuses on local alignments and restricts the possible length of the sequences alignment. A less widely used approach is to fold the sequences using single sequence structure prediction methods and align the resulting structures using tree-based metrics. The fundamental weakness with this approach is that single sequence predictions are often inaccurate, thus all further analyses are affected. Once secondary structure of RNA is known, the next challenge is to predict tertiary structure. The biggest problem is to determine the structure of regions between double stranded helical regions. Also RNA molecules often contain posttranscriptionally modified nucleosides, which because of new possible non-canonical interactions, cause a lot of troubles for tertiary structure prediction. The three-dimensional structure prediction methods can use comparative modeling which starts from a related known structure known as the template. The alternative strategy is de novo modeling of RNA secondary structure which uses physics-based principles such as molecular dynamics or random sampling of the conformational landscape followed by screening with a statistical potential for scoring. These methods either use an all-atom representation of the nucleic acid structure or a coarse-grained representation. The low-resolution structures generated by many of these modeling methods are then subjected to high-resolution refinement. ^ Ponce-Salvatierra, Almudena; --, Astha; Merdas, Katarzyna; Chandran, Nithin; Ghosh, Pritha; Mukherjee, Sunandan; Bujnicki, Janusz M (2019-01-22). "Computational modeling of RNA 3D structure based on experimental data". Bioscience Reports. 39 (2): BSR20180430. doi:10.1042/bsr20180430. ISSN 0144-8463. PMID 30670629. ^ Magnus, Marcin; Matelska, Dorota; Łach, Grzegorz; Chojnowski, Grzegorz; Boniecki, Michal J; Purta, Elzbieta; Dawson, Wayne; Dunin-Horkawicz, Stanislaw; Bujnicki, Janusz M (2014-04-23). "Computational modeling of RNA 3D structures, with the aid of experimental restraints". RNA Biology. 11 (5): 522–536. doi:10.4161/rna.28826. ISSN 1547-6286. PMC 4152360. PMID 24785264. ^ a b c Mathews D.H. (2006). "Revolutions in RNA secondary structure prediction". J. Mol. Biol. 359 (3): 526–532. doi:10.1016/j.jmb.2006.01.067. PMID 16500677. ^ Mathews DH, Disney MD, Childs JL, Schroeder SJ, Zuker M, Turner DH (2004). "Incorporating chemical modification constraints into a dynamic programming algorithm for prediction of RNA secondary structure". Proceedings of the National Academy of Sciences USA. 101 (19): 7287–7292. Bibcode:2004PNAS..101.7287M. doi:10.1073/pnas.0401799101. PMC 409911. PMID 15123812. ^ a b Mathews DH, Sabina J, Zuker M, Turner DH (1999). "Expanded sequence dependence of thermodynamic parameters improves prediction of RNA secondary structure". J Mol Biol. 288 (5): 911–40. doi:10.1006/jmbi.1999.2700. PMID 10329189. ^ Zuker M.; Sankoff D. (1984). "RNA secondary structures and their prediction". Bull. Math. Biol. 46 (4): 591–621. doi:10.1016/s0092-8240(84)80062-2. ^ a b c Nussinov R, Piecznik G, Grigg JR and Kleitman DJ (1978) Algorithms for loop matchings. SIAM Journal on Applied Mathematics. ^ a b Nussinov R, Jacobson AB (1980). "Fast algorithm for predicting the secondary structure of single-stranded RNA". Proc Natl Acad Sci U S A. 77 (11): 6309–13. Bibcode:1980PNAS...77.6309N. doi:10.1073/pnas.77.11.6309. PMC 350273. PMID 6161375. ^ Zuker M, Stiegler P (1981). "Optimal computer folding of large RNA sequences using thermodynamics and auxiliary information". Nucleic Acids Res. 9 (1): 133–48. doi:10.1093/nar/9.1.133. PMC 326673. PMID 6163133. ^ a b Rivas E, Eddy SR (1999). "A dynamic programming algorithm for RNA structure prediction including pseudoknots". J Mol Biol. 285 (5): 2053–68. arXiv:physics/9807048. doi:10.1006/jmbi.1998.2436. PMID 9925784. ^ Zuker M (2003). "Mfold web server for nucleic acid folding and hybridization prediction". Nucleic Acids Research. 31 (13): 3406–3415. doi:10.1093/nar/gkg595. PMC 169194. PMID 12824337. ^ Reeder J.; Giegerich R. (2004). "Design, implementation and evaluation of a practical pseudoknot folding algorithm based on thermodynamics". BMC Bioinformatics. 5: 104. doi:10.1186/1471-2105-5-104. PMC 514697. PMID 15294028. ^ a b Ding Y, Lawrence CE (2003). "A statistical sampling algorithm for RNA secondary structure prediction". Nucleic Acids Res. 31 (24): 7280–301. doi:10.1093/nar/gkg938. PMC 297010. PMID 14654704. ^ Lyngsø RB, Pedersen CN (2000). "RNA pseudoknot prediction in energy-based models". J Comput Biol. 7 (3–4): 409–427. CiteSeerX 10.1.1.34.4044. doi:10.1089/106652700750050862. PMID 11108471. ^ Gardner P.P. ; Giegerich, Robert (2004). "A comprehensive comparison of comparative RNA structure prediction approaches". BMC Bioinformatics. 5: 140. doi:10.1186/1471-2105-5-140. PMC 526219. PMID 15458580. ^ a b Hofacker IL, Fekete M, Stadler PF (2002). "Secondary structure prediction for aligned RNA sequences". J Mol Biol. 319 (5): 1059–66. CiteSeerX 10.1.1.73.479. doi:10.1016/S0022-2836(02)00308-X. PMID 12079347. ^ Ruan, J., Stormo, G.D. & Zhang, W. (2004) ILM: a web server for predicting RNA secondary structures with pseudoknots. Nucleic Acids Research, 32(Web Server issue), W146-149. ^ Bernhart SH, Hofacker IL (2009). "From consensus structure prediction to RNA gene finding". Brief Funct Genomic Proteomic. 8 (6): 461–71. doi:10.1093/bfgp/elp043. PMID 19833701. ^ Sankoff D (1985). "Simultaneous solution of the RNA folding, alignment and protosequence problems". SIAM Journal on Applied Mathematics. 45 (5): 810–825. CiteSeerX 10.1.1.665.4890. doi:10.1137/0145048. ^ a b Hofacker IL, Bernhart SH, Stadler PF (2004). "Alignment of RNA base pairing probability matrices". Bioinformatics. 20 (14): 2222–7. doi:10.1093/bioinformatics/bth229. PMID 15073017. ^ Havgaard JH, Lyngso RB, Stormo GD, Gorodkin J (2005). "Pairwise local structural alignment of RNA sequences with sequence similarity less than 40%". Bioinformatics. 21 (9): 1815–24. doi:10.1093/bioinformatics/bti279. PMID 15657094. ^ Torarinsson E, Havgaard JH, Gorodkin J. (2007) Multiple structural alignment and clustering of RNA sequences. Bioinformatics. ^ Mathews DH, Turner DH (2002). "Dynalign: an algorithm for finding the secondary structure common to two RNA sequences". J Mol Biol. 317 (2): 191–203. doi:10.1006/jmbi.2001.5351. PMID 11902836. ^ Harmanci AO, Sharma G, Mathews DH, (2007), Efficient Pairwise RNA Structure Prediction Using Probabilistic Alignment Constraints in Dynalign, BMC Bioinformatics, 8(130). ^ Holmes I. (2005) Accelerated probabilistic inference of RNA structure evolution. BMC Bioinformatics. 2005 Mar 24;6:73. ^ Kiryu H, Tabei Y, Kin T, Asai K (2007). "Murlet: A practical multiple alignment tool for structural RNA sequences". Bioinformatics. 23 (13): 1588–1598. doi:10.1093/bioinformatics/btm146. PMID 17459961. ^ Shapiro BA and Zhang K (1990) Comparing Multiple RNA Secondary Structures Using Tree Comparisons Computer Applications in the Biosciences, vol. 6, no. 4, pp. 309–318. ^ Shapiro BA, Yingling YG, Kasprzak W, Bindewald E. (2007) Bridging the gap in RNA structure prediction. Curr Opin Struct Biol. ^ Major F, Turcotte M, Gautheret D, Lapalme G, Fillion E, Cedergren R (Sep 1991). "The combination of symbolic and numerical computation for three-dimensional modeling of RNA". Science. 253 (5025): 1255–60. doi:10.1126/science.1716375. PMID 1716375. ^ Major F, Gautheret D, Cedergren R (Oct 1993). "Reproducing the three-dimensional structure of a tRNA molecule from structural constraints". Proc Natl Acad Sci U S A. 90 (20): 9408–12. Bibcode:1993PNAS...90.9408M. doi:10.1073/pnas.90.20.9408. PMC 47577. PMID 8415714. ^ Frellsen J, Moltke I, Thiim M, Mardia KV, Ferkinghoff-Borg J, Hamelryck T (2009). "A probabilistic model of RNA conformational space". PLoS Comput Biol. 5 (6): e1000406. Bibcode:2009PLSCB...5E0406F. doi:10.1371/journal.pcbi.1000406. PMC 2691987. PMID 19543381. ^ Rother, Magdalena; Rother, Kristian; Puton, Tomasz; Bujnicki, Janusz M. (2011-02-07). "ModeRNA: a tool for comparative modeling of RNA 3D structure". Nucleic Acids Research. 39 (10): 4007–4022. doi:10.1093/nar/gkq1320. ISSN 1362-4962. ^ Neocles B Leontis; Eric Westhof, eds. (2012). RNA 3D structure analysis and prediction. Springer. ISBN 9783642257407. OCLC 795570014. ^ Vangaveti, Sweta; Ranganathan, Srivathsan V.; Chen, Alan A. (2016-10-04). "Advances in RNA molecular dynamics: a simulator's guide to RNA force fields". Wiley Interdisciplinary Reviews: RNA. 8 (2): e1396. doi:10.1002/wrna.1396. ISSN 1757-7004. ^ Chen, Shi-Jie (June 2008). "RNA Folding: Conformational Statistics, Folding Kinetics, and Ion Electrostatics". Annual Review of Biophysics. 37 (1): 197–214. doi:10.1146/annurev.biophys.37.032807.125957. ISSN 1936-122X. ^ Laing, Christian; Schlick, Tamar (June 2011). "Computational approaches to RNA structure prediction, analysis, and design". Current Opinion in Structural Biology. 21 (3): 306–318. doi:10.1016/j.sbi.2011.03.015. ISSN 0959-440X. ^ Boniecki, Michal J.; Lach, Grzegorz; Dawson, Wayne K.; Tomala, Konrad; Lukasz, Pawel; Soltysinski, Tomasz; Rother, Kristian M.; Bujnicki, Janusz M. (2015-12-19). "SimRNA: a coarse-grained method for RNA folding simulations and 3D structure prediction". Nucleic Acids Research. 44 (7): e63–e63. doi:10.1093/nar/gkv1479. ISSN 0305-1048. ^ Stasiewicz, Juliusz; Mukherjee, Sunandan; Nithin, Chandran; Bujnicki, Janusz M. (2019-03-21). "QRNAS: software tool for refinement of nucleic acid structures". BMC Structural Biology. 19 (1). doi:10.1186/s12900-019-0103-1. ISSN 1472-6807. Baker D, Sali A (2001). "Protein structure prediction and structural genomics". Science. 294 (5540): 93–6. Bibcode:2001Sci...294...93B. doi:10.1126/science.1065659. PMID 11588250. Chiu D.K. ; Kolodziejczak T. (1991). "Inferring consensus structure from nucleic acid sequences". Comput. Appl. Biosci. 7 (3): 347–352. doi:10.1093/bioinformatics/7.3.347. Do CB, Woods DA, Batzoglou S (2006). "CONTRAfold: RNA secondary structure prediction without physics-based models". Bioinformatics. 22 (14): e90–8. doi:10.1093/bioinformatics/btl246. PMID 16873527. Gutell R.R. ; et al. (1992). "Identifying constraints on the higher-order structure of RNA: continued development and application of comparative sequence analysis methods". Nucleic Acids Res. 20 (21): 5785–5795. doi:10.1093/nar/20.21.5785. PMC 334417. PMID 1454539. Leontis NB, Lescoute A, Westhof E (2006). "The building blocks and motifs of RNA architecture". Curr Opin Struct Biol. 16 (3): 279–87. doi:10.1016/j.sbi.2006.05.009. PMC 4857889. PMID 16713707. Lindgreen S, Gardner PP, Krogh A (2006). "Measuring covariation in RNA alignments: physical realism improves information measures". Bioinformatics. 22 (24): 2988–95. doi:10.1093/bioinformatics/btl514. PMID 17038338. Lorenz, Ronny (2014). RNA secondary structure thermodynamics and kinetics. Vienna, Austria: University of Vienna, Dissertation. Macke T, Case D (1998). "Modeling Unusual Nucleic Acid Structures". Modeling unusual nucleic acid structures. In Molecular Modeling of Nucleic Acids. Edited by Leontes N, SantaLucia JJ. Washington, DC. ACS Symposium Series. 682. American Chemical Society. pp. 379–393. doi:10.1021/bk-1998-0682.ch024. ISBN 978-0-8412-3541-0. Major F (2003). "Building three-dimensional ribonucleic acid structures". Computing in Science & Engineering. 2003 (5): 44–53. doi:10.1109/MCISE.2003.1225860. Massire C, Westhof E. "MANIP: an interactive tool for modelling RNA". J Mol Graph Model. 1998 (16): 197–205, 255–257. Parisien M.; Major F. (2008). "The MC-Fold and MC-Sym pipeline infers RNA structure from sequence data". Nature. 452 (7183): 51–55. Bibcode:2008Natur.452...51P. doi:10.1038/nature06684. PMID 18322526. Tuzet, H. & Perriquet, O., 2004. CARNAC: folding families of related RNAs. Nucleic Acids Research, 32(Web Server issue), W142-145. Touzet H (2007). Comparative analysis of RNA genes: the caRNAc software. Methods in Molecular Biology. 395. pp. 465–474. doi:10.1007/978-1-59745-514-5_29. ISBN 978-1-58829-693-1. Yingling YG, Shapiro BA (2006). "The prediction of the wild-type telomerase RNA pseudoknot structure and the pivotal role of the bulge in its formation". J Mol Graph Model. 25 (2): 261–274. doi:10.1016/j.jmgm.2006.01.003. PMID 16481205. Zwieb C, Muller F (1997). "Three-dimensional comparative modeling of RNA". Nucleic Acids Symp Ser. 36 (36): 69–71. PMID 9478210. This page was last edited on 2 April 2019, at 11:36 (UTC).